Enter a URL and show which tags are most related to it. Visualized in a tag cloud. Input URL to scrape tags from delicious. The tool outputs a tag cloud, which can be converted to .pdf or .svg by copying and pasting results into the Tag Cloud Generator. The Delicious Tags Scraper can be used in various ways, each following from the fact that delicious provides in a single space varying accounts of a website or URL. This is one answer to the question "What is ... ?" and the folksonomy, or user-generated classification, may serve to summarize a website's content. In further analysis one may also seek to contrast an institution's own 'keywords' with those provided by delicious users. Do users share terminology with the institution, or depart from it? In the case of 911truth.org, disparity surrounds the term "conspiracy," which is largely avoided by 911truth: "911Truth.org looks not to create a new conspiracy industry, but to achieve full disclosure of hidden realities that affect all of our lives" (link). By contrast "conspiracy" is central to users' accounts of the website. 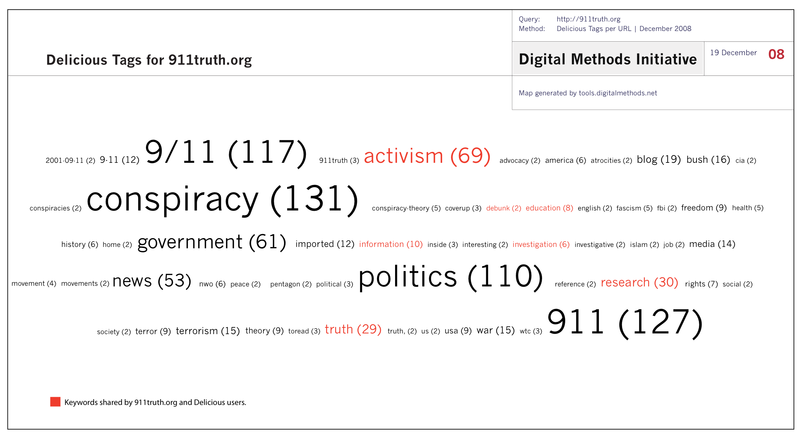 Display delicious tags for 911truth.org by inputting URL into the Delicious Tags Scraper. Copy results into the Tag Cloud Generator to produce an .svg or .pdf.